Mario is celebrating his 30th anniversary this year and for the first time ever in a Mario game, creativity has been put into the hands of you, the player. Super Mario Maker has an endless amount of courses for you to tackle. Some have been designed by Nintendo, others will be designed by players all over the world. 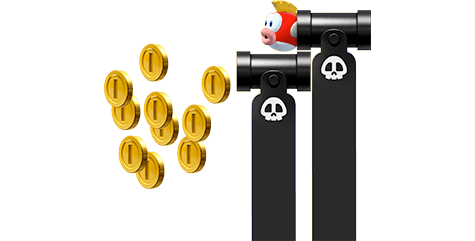 The content for Mario Maker will only grow. Let your creativity loose with the easy to use level designer, break typical Super Mario conventions by combining different enemies and items and edit or remix other players courses with the instant edit feature. With four different themes to play with, the only limit is you imagination. Created a masterpiece? It's easy to share your designs with the whole world. Need some inspiration? Play through other players unique designs. Super Mario Maker is an experience like no other. Super Mario Maker gives you an unlimited number of levels to play, designed by Nintendo and players from all around the world. There are already dozens of sample courses that will be playable right away and the number of courses will only grow as the community begins creating and sharing their own designs. Super Mario Maker is a Mario game that will never end! 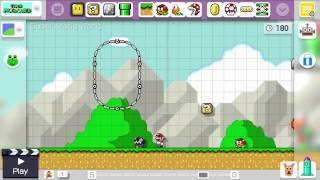 Unleash your inner game designer by building your own levels with Super Mario Maker. With an intuitive level designer that makes full use of the Wii U's gamepad's touch controls, think of the gamepad as a canvas for you to let your imagination loose. Instantly edit a course, creating a seamless experience between playing and creating. 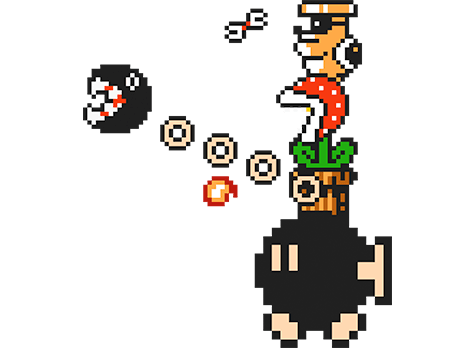 Break typical Super Mario conventions by combining different enemies, traps and items to create unique and unexpected twists. Switch between four distinct themes, each with different art styles and features. Add the mystery mushroom into your level to play as different characters or tap compatible amiibo's on your gamepad to play as that character. With Super Mario Maker the only limit is your imagination. Super Mario Maker makes it incredibly easy to upload your courses and to find ones created by gamers all over the world. You can even remix other people's courses and add your own flair to their design. So if you've made a great level it's easy to share it with the entire world! Super Mario Maker has amiibo support! If you tap a compatible amiibo on the gamepad after getting the mystery mushroom, Mario will transform into that character. A large roster of amiibo's are supported including: Link, Yoshi and even the Wii Fit Trainer. 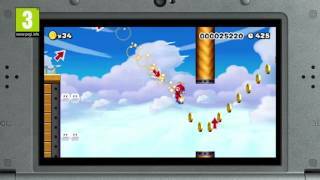 Now Nintendo 3DS owners will have access to a near-unlimited wealth of Super Mario courses to play. 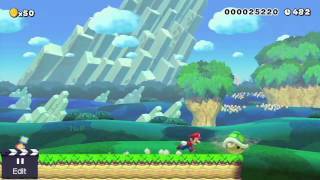 Players can also create courses with nearly all of the tools available in the original Wii U version, along with interactive lessons. In a feature unique to the Nintendo 3DS version, friends can collaborate on level designs by sharing them with another game owner locally before they're complete. Super Mario Maker celebrates 30 years of everyone's favourite plumber in style! Let your imagination run wild and share your ideas to the world with Super Mario Maker. 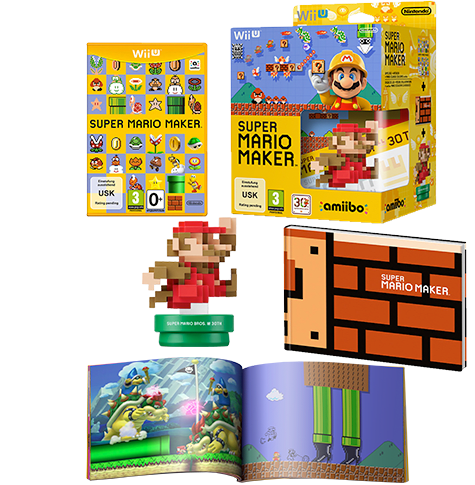 The Limited Edition of Super Mario Maker comes with a special booklet full of fun ideas to help you create your own classic levels, and an incredible limited edition 30th anniversary Mario amiibo. If you tap this amiibo on your Wii U gamepad controller you can add a big mushroom power-up to your course. A great edition for Mario fans to commemorate everyone's favourite plumber! Play, Build, Share. Super Mario Maker is a Mario experience like no other, putting creativity in your hands. With a nearly limitless amount of levels created by Nintendo and players from all over the world, Super Mario Maker celebrates 30 years of everyone's favourite plumber in style! 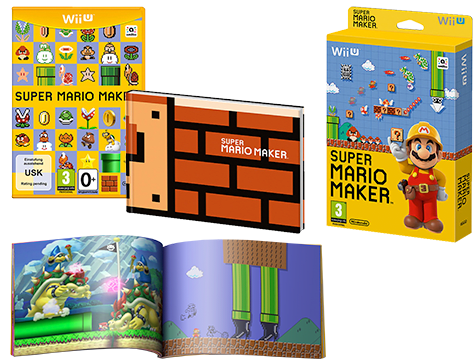 The standard edition of Super Mario Maker comes with a booklet that is packed full to the brim with ideas and tips for designing courses that will help get your creativity flowing! 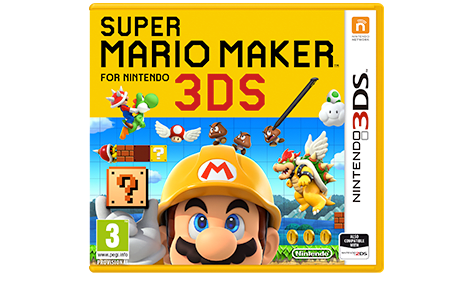 Experience Super Mario Maker on your Wii U today when you purchase and download on Nintendo eShop! Why wait to get creative? 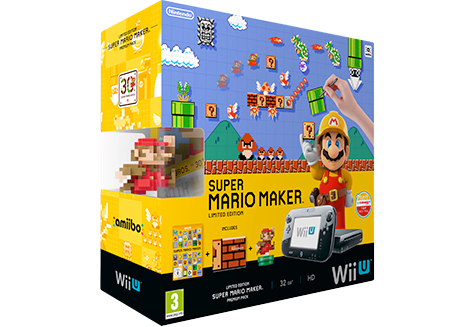 Celebrate Super Mario's 30th Anniversary in true style with the Wii U Console, including the Super Mario Maker Limited Edition!